Not 50% open rate, mind you. 50% REPLY rate. That means half of the people I wrote to actually replied to me. And 100% of those were kind replies. Not “leave me alone” or “unsubscribe” kind of replies. I started some nice conversations and got a couple of people on Skype – which was the purpose of my email. Here’s my exact copy and some comments on how I constructed it. One of the initial steps we needed to take with Woodpecker was defining the ideal customer profile. In order to find a direction for further research, we wanted to talk to people who send cold emails on a daily basis. We wanted to find out who they are, how they work, what their purpose for sending cold emails is, and how they actually manage the very process. Remember that I wasn’t looking for customers. I was looking for experts who would like to share their experience with me. I needed people who actually wrote and sent cold emails and knew how the whole process of cold emailing and following-up looks like. So were did I start? I found some questions considering cold email on Quora, and checked out the people who wrote answers to those questions. Then, I found some great articles on cold emails and checked out their authors. This way, I created a list of 22 people who might be considered experts in the field, or at least experienced professionals. My list included their names, email addresses, the links to their blogs/websites and, if possible, the links to the very posts I was going to refer to in my email. I also had an additional field in my spreadsheet including a short note on what I especially liked their post/Quora answer for. The first thing I did was the research on my addressees, as described above. I believe that it’s easier to compose an actually valuable cold email, if you actually know who you are writing to. That helps keep the message in a more personal tone. Second, I was just after finishing our first PDF 15 Cold Email Templates that Will Get You Leads. In order to prepare this report, I needed to read dozens of posts and articles on best cold emailing practices. I had a full stack of tips and tricks that were already proven to work by other people. I had the theory worked out. And I was eager to test the theory in practice. What was the actual copy of my opening message? 1. The “from” line which includes my first name as well as the name of my company. As I’m writing to people who are in business, mostly from B2B companies, I know that they expect to hear from people from other business organizations. They are open to new relations with other companies so such a “from” line does not scare them off, quite the opposite – it intrigues them. Plus they are more likely to remember the name of my company if they see it in the “from” line, and not only in the body of my email – and that’s what I mean them to. 2. The subject line that refers to their actual blog, to a specific post, or a comment on Quora they have actually written. Look how the subject line is all about them. Plus, it sometimes includes the name of their blog so it’s highly personalized – it screams “this email has been written especially to you”, which it was, as a matter of fact. 3. The introduction that continues on the blog post or comment and specifies the reason why I liked it so much that I decided to reach out to them in person. Note that it isn’t just “I liked your post.” It’s “I liked your post BECAUSE”, and that’s a huge difference because that’s what poses a real value for them here. 4. 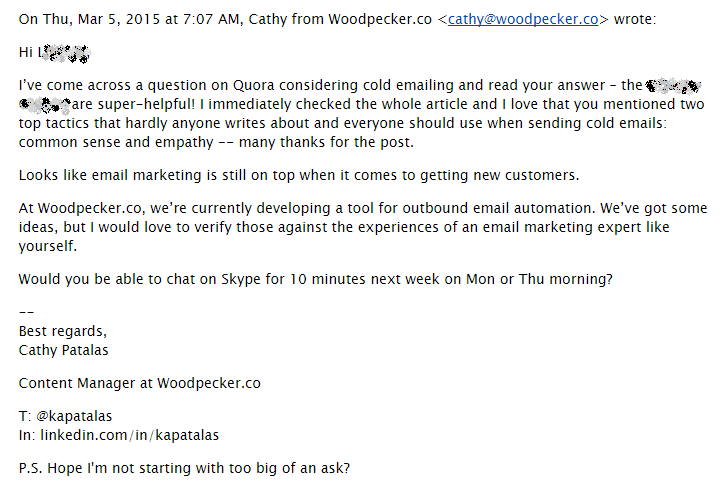 The value proposition that is naturally linked with the intro: I start about their post on cold emails and I invite them to a conversation on the same topic. Additionally, I play to my addressees egos again in the value proposition, stating clearly that I consider them experts in the field and that’s why I want to talk to them and verify my ideas against their expertise. 5. The CTA which clearly states when I want to talk to them, how I want to make the meeting happen, and how long it will take. This way it’s easier for them to quickly estimate, if they will be able to sacrifice their time for the chat with me. 6. The signature including my full name, my Twitter and LinkedIn profiles, plus the link to our company website – so they could see who I am and find some more information on the project I’m involved in. That raises my credibility and makes them feel safe writing back to me. I know you might probably have some doubts reading this. Firstly, you may think the approach is not scalable. It takes a lot of time and research to create such personalized messages. And 22 people are nothing if you think of real prospecting. Well yes, it takes time. And don’t you think that it was easy for me to spend a couple days finding all those information and reading all those posts. It wasn’t. But in the end, I got 11 replies out of 22 emails I sent in general. The 50% reply rate comes from the quality of the outreach, not the quantity of prospects I reached out to. If I sent a less personalized email to 100 prospects, and got a 10% reply rate (which is good, anyway) I would end up with the same number of replies. So was it worth the fuss? I say yes. Remember that for a truly effective cold email campaign, it is quality of your contact base and your messages that matter the most. Secondly, you may think that it was easy for me because I was referring to the articles or comments on cold emails, and what I was offering was a conversation on the very same topic. But hey, that’s how a well-chosen prospect base makes email writing easier – that’s another thing to keep in mind before you start your own campaign. What could I do to make it even better? There are two things I would do differently now. And these are the two things you should use in your own campaign. One – even though I got this amazing reply rate, I only managed to actually talk to a couple of people. Some of my addressees asked if they could answer my questions via email. I probably asked for too much too soon. Remember to warm up your addressees before you ask for a chat on the phone. Maybe a few emails with some questions would work better for starters? Maybe an interaction on social media would help you become a person they recognize? Two – I sent just this one email with no follow-ups whatsoever. And that’s a shame, because if I followed up with the people who didn’t respond to my first email, I would probably get even more replies. Don’t repeat my mistake – always send follow-ups. Had I had Woodpecker then, I would have definitely set up a follow-up sequence. Woodpecker helps you send your personalized follow-ups automatically in a human-like way. Just like you were sending them yourself. This campaign was a success. But as you can see, there is always something about a campaign that may be done better. So research, write, send, test, edit and send some more. Previous postValue Proposition – How to Tell My Addressee What I Want from Them? Great article Cathy! I liked the way you have spent time on researching your prospects and sending them very personalized emails. Thanks Gokul! Research takes time, but it’s definitely worth it in the long run. Some useful tips, Cathy. Thanks! I especially like how you break down your email into the 6 steps for easier understanding of the concepts. Thank you Welly, it’s great to know that you found it helpful.